She was born to a very traditional backdrop, in a classic city, to a conventional family, for the common lifestyle… She ate her mother’s traditional cuisine and learnt its ways. She went to school and there she learnt the doctrines of classic life. She went to the market and saw these traditions in action… she was surrounded by all things traditional… and perhaps she was meant to lead an ordinary and immemorial life…. The story of most women! But not She! No, she loved the classics, but she had character too. She wanted the traditions to live on, however, understood how the winds of change that are sweeping this earth are capable of taking all this familiarity away. She, herself, was doubtful if pure classic was exciting enough yet still related. She struggled for a while until one day…. she saw the traditional as a canvas on which she’d stroke the brush of a more exciting life. One through which she painted her vision of the perfect classics, giving them a facelift, that will enable these traditions to live on even in a world where all things old are quickly vanishing, replaced by the glamour of all things new. She had to have her say, and she did it her way! Perhaps unwittingly, or the contrary, through the very ordinary she found a way to the extraordinary and made sure to be heard and definitely unforgotten!! 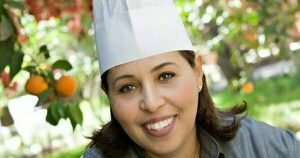 Meet Zakia, the executive Chef of Dar Rhizlane Hotel – Marrakech. The woman known for revamping traditional Moroccan cuisine. Through her finesse and eye for presentation, her deep understanding of the cuisine and her courage to have her say with ingredients, she managed to become one of Morocco’s most celebrated chefs, whose nouvelle Moroccan cuisine is one of Morocco’s must experiences. 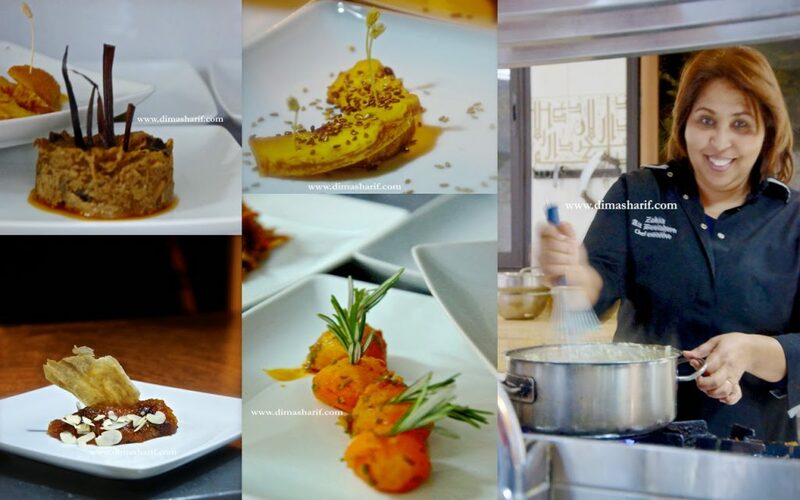 Most impressively, Chef Zakia is a self-taught chef; she literally did it her way, a lesson or two to be inspired by. Zakia is in many ways the classic story that involves cooking. She comes from a home of brilliant cooks. Her mother and grandmother are famous for their amazing food, however they never kept their cooking to just home. In fact, the two are professional cooks known as “the great cooks of the Mamounia-a queen’s Palace”. They specialise in traditional Moroccan cuisine and thus Zakia grew up savouring a superior version of this food. She says that growing up she always knew she was eating outstanding food, her country’s food at its best. She, like many girls do, loved cooking with her mother in the kitchen. In fact, there were many days that she herself would cook the family’s whole dinner as she recalled. Once older she decided to follow the footsteps of her mother and become a professional cook herself. However, Zakia always thought that the traditional ways could be bettered. For instance, she thought that traditional food was too heavy on the fats, and in today’s life we could do with less fats. She also mentioned that when it came to presentation, she felt bored with the same old communal look of food, and preferred the more modern and minimal style. These opinions did not win her any favours with her mother, who thought that Zakia would not make it as a professional cook. Her mother – as she mentioned – was a tad less than happy that Zakia had chosen to become a cook by profession and therefore did not exactly support her to secure a job in the kitchen! Zakia, had to be a stubborn and strong willed woman to possess the perseverance required to enter a professional world in which she was not formally trained nor had any real experience in. Everyone thought it was a phase and that she was not going to make it in that field. Mindless to those very encouraging opinions, she started off as junior as any kitchen staff can be and it was not long until she was noticed in that kitchen. Her Chef saw potential in her and in a very short while she became the executive chef of her vision to the perfected classics. With her creative twists coupled with her inventive style, her restaurant was offering its diners a whole new take on Moroccan cuisine. While she can go the route of fusions at times, she insists to show that her cuisine is mostly purely Moroccan, however, seen with fresh eyes. All this made her food the talk of gourmet recommendations of things one must eat when in Marrakech. A chat with Zakia is very inspiring, her smile is contagious and her pride in her accomplishments is very well felt. It is not everyone’s choice to work hard, challenge and have a say especially when this say is not very well received at first. All that is definitely not the easy route, however, meeting this woman and seeing the life in which she lives, one can’t help but ponder! Perhaps her story is not the classic story, but she well wrote its lines and made sure it was well grounded in both her surroundings and individual identity. It is her story and she told it her way. There is no mistaking how she feels about it; you can taste it in her food, you can see it in her face and you can hear it in what’s been said about her. Goes to tell that when we have the “will to do” we can and we will. 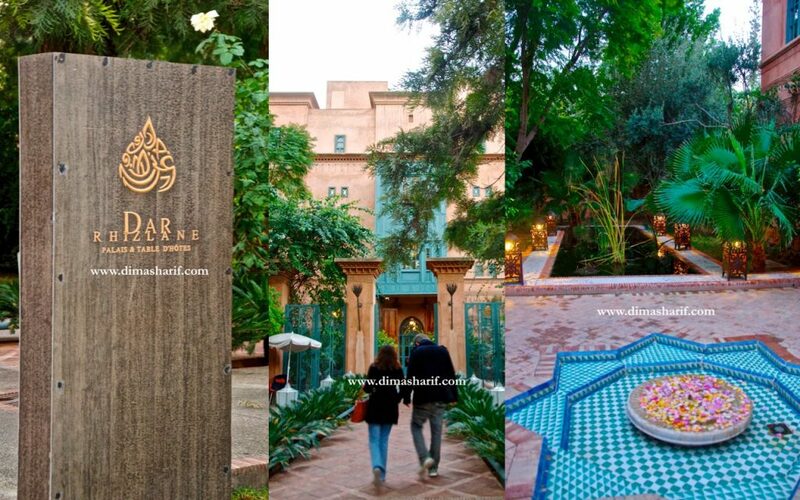 Hotel Dar Rhizlane is an interesting surprise in Marrakech. Having been trotting on the traditional path of the city for a while, visiting this more modern retreat was interesting to say the least. The hotel is very Andalusian in style, a very Arab-moorish palace feel with a few more modern touches. This boutique hotel is beautiful, green and feels so airy and comforting, which makes it a good place to stay when in Marrakech. It is located near to the Djema El Fna square and to the medina, making it easily accessible and close by most of what you would want to explore. The Dar Rhizlane cuisine is a must in Marrakech, and when there make sure to speak with Chef Zakia and see for yourselves what an inspiration she is. For more info visit the hotel’s website here.